In case you missed the first 2 entries to the countdown of the top UC hoopsters of the decade, here are 12-10, and here are 9-7. As we stroll down memory lane, it's hard to not get excited about this years team. This is the first UC team in at least 5 years that has a chance at making the NCAA tournament, and the first UC team in 6 years that could win a game in the tournament. It's hard to believe that the Iowa game was so long ago. But given the past few years, it seems like a whole lot longer. 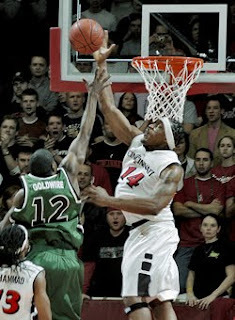 Without further ado, let's hit the list of the top Bearcats of the decade. 6. Eric Hicks. Eric Hicks was a major fan favorite, and the heart and soul of the 2005-06 team that Andy Kennedy coached. Hicks matured before our eyes, getting better every season and becoming a team leader. 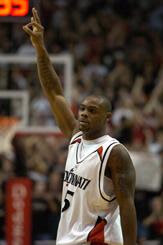 Hicks averaged 10 points and 7 boards a game his UC career. The last 2 seasons tell the real story. When he got into the starting line up, Eric put in 13.7 and 15 and 9 and 9.7 rebounds a game. He improved his shooting, making 13 of 27 3s his senior year, and making 65% of his free throws after shooting 47%, 53% and 58%. Eric Hicks had a non stop engine, and his hard work and high level of play make him the 6th best Bearcat on this list. Also, Eric Hicks was a monster in NCAA Hoops 05. He put up at least 4 triple doubles his junior year, and averaged a double double. Video game Eric Hicks and Jason Maxiell couldn't be stopped. 5. Kenny Satterfield. Kenny Satterfield and DerMarr Johnson were the 2 big hot shot recruits Bob Huggins brought in for the 99-00 season. They both went pro after their freshman years, but Kenny Satterfield hung around for his sophomore year. Kenny split time starting with I believe Steve Logan his freshman year, but ran the show his second. Kenny averaged 11.9 points, 5.2 assists, 4.1 rebounds and 1.4 assists his career. As a starter his sophomore year, he put up 14.4, 5.1, 4.7 and 1.7 a game. Kenny wasn't a great shooter, and I always got the impression that he thought he was a better shooter than he actually was. Satterfield is remembered by some as being brash and arrogant, and for missing a potential game tying or winning shot against Xavier, but the man was a player. He was the engine for the machine that went to the Sweet 16 in the 01 tournament, the farthest a UC team has gone since 1996. His alley oop to Immanuel McElroy is still burned into my brain, as high school Scott stayed up late to watch UC go down to Stanford. Hicks should be higher! 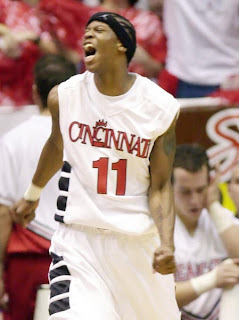 Toughest Bearcat ever!! !